Radiology questions whether they’re identifying appropriate care or denying it. Ever since the Eastman Kodak Company added film to the x-ray process, advances in radiology increased the number of tools in a radiologist’s tool kit. In 1956, when ultrasound was first used for medical purposes, the tool kit grew. CT was added in 1972, while MRI was cleared for commercial use by the FDA in 1984. However, with these advancements have come increases in imaging usage and cost—from $6.89 billion to $14.1 billion in Medicare Part B imaging spending between 2000 and 2006, according to the U.S. Government Accountability Office (GAO) report to Congress this past June. That 104% increase has driven an effort to curb costs and ensure that new technology is being utilized effectively for patients and for the bottom line. 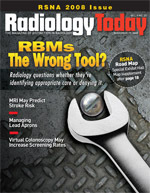 Radiology benefits management companies (RBMs) are adding magnifying glasses, calculators, and sharpened pencils to the process as they step between physicians and insurance providers in the healthcare arena. RBMs are intended to ensure that patients receive consistent quality and appropriate imaging services, particularly as technology advances continue to make their way into imaging suites across the country. However, debate remains about whether RBMs belong in the medical care decision-making process or are primarily tools to contain costs. Clearly, patients benefit from advances in imaging technology. As James H. Thrall, MD, FACR, notes, imaging procedures can often replace invasive surgical procedures, minimizing the risk of treatment complications and reducing a patient’s recovery time. As radiologist-in-chief of Massachusetts General Hospital in Boston, Thrall sees many instances of how imaging can play an effective part of the patient diagnosis process. But with trillions of dollars spent on healthcare in the United States, cost issues need to be addressed. Closer scrutiny of imaging spending began as recently as 2005 when the Medicare Payment Advisory Commission (MedPAC) reported to Congress on the increasing number of imaging exams provided, as well as greater use of high-technology imaging such as MRI vs. x-rays in diagnostic testing. This report attributed growth not only to technology advances but also to the increase in the number of in-office imaging procedures. It also pointed out that the number of imaging services provided across the country varies significantly from state to state, suggesting possible overuse in certain areas. The Centers for Medicare & Medicaid Services (CMS) adopted some of MedPAC;s recommendations beginning in 2006. In addition, further constraints on imaging services spending began with the Deficit Reduction Act of 2005. The CMS, along with Health and Human Services (HHS), worked on the act with Congress in an attempt to manage one of the fastest-growing services under Medicare Part B. Those cuts were lobbied against heavily by radiology organizations but, as enacted, cut Medicare imaging spending by $1.8 billion in 2007, according to a new GAO report released in September. That represents a decrease of 12.7% from the previous year compared with the average annual 11.4% increases from 2000 to 2006. The June GAO report noted that financial incentives for physicians to offer imaging services within their practice is a primary influence on the recent growth of in-office imaging. The proportion of Medicare imaging spending devoted to in-office services increased from 58% to 64% during the six-year time period studied. Other reasons include technology advances, direct-to-patient consumer advertising, defensive medicine to protect physicians from malpractice suits, and an increase in clinical applications. The June report also noted that the highest growth rates occurred among the advanced imaging services of MRI, CT, and nuclear medicine. Spending in these modalities increased almost twice as fast as spending on other imaging procedures such as ultrasounds and x-rays. The rationale for the difference is that advanced imaging services are more complex, they most often involve payments for conducting the exam and reviewing results, and equipment for these modalities is more expensive and requires more highly skilled technicians to operate. The June GAO report recommended that the CMS add more preauthorization mechanisms in an attempt to manage imaging costs, a recommendation that RBMs have found cost-effective and worthwhile. Private health plan practices that were examined as part of the GAO’s reporting also noted increases in imaging services, particularly in advanced imaging. These plans adopted management practices, including preauthorization, that helped constrain their spending growth on imaging services. While they’ve appeared effective at curbing costs, physicians and industry experts worry about what the GAO recommendations may mean to the quality of medical care in addition to the threat to their revenue. These two groups believe accreditation and appropriateness criteria are the answer. Thrall explains that RBMs emerged as a “cottage industry” to help insurance companies concerned with the rapid increase in imaging costs. When they believe that the growth is not being appropriately managed, health insurance companies hire RBMs to help manage costs, as well as the quality of imaging care. Some current players in the RBM marketplace include MedSolutions; American Imaging Management, Inc; Care to Care, LLC; and Magellan Health Services, Inc, which owns National Imaging Associates, Inc.
MedSolutions CEO Curt Thorne says imaging plays an important part in the diagnostic process, and the role of the RBM is to ensure that patients receive the correct imaging studies. And in the course of providing appropriate imaging services, the healthcare system saves money. According to a September Congressional Budget Office report on baseline budget projections, Medicare spending is expected to grow from $454 billion this year to $570 billion by 2012 (a 25% increase) and to $822 billion (an additional 44% from 2012) by 2016. If those projections hold, Medicare spending would rise from 16% of total federal outlays in 2007 to 18.9% by 2016. In that same time period, the budget office projects the government’s annual budget deficit to climb from $454 billion to $735 billion (61.8%). “It’s pretty important that we engage the debate over how we take care of the healthcare needs of America,” Thorne says. MedSolutions signed its first radiology management contract in 1996 but actually got its start in the industry in 1992 as an owner/operator of diagnostic imaging centers. It was this early perspective on imaging utilization and cost that the company used to segue into managing radiology spending. Thorne says 85% of MedSolutions’ focus is on outpatient imaging, covering both commercial and government-sponsored health benefits programs. When a request for imaging comes to the RBM for preauthorization, medical professionals such as nurses and radiologists speak with physicians about using the best imaging technology that meets patients’ needs. The request for imaging must meet the proper evidence-based guidelines for approval. Thorne explains that the marketplace driver for RBMs is the increase in costs, particularly among the advanced-imaging services, which account for 20% of all scans but 60% of the costs. He says they also see healthcare variations across the country, where one region may be adopting new imaging tech-nology faster than another. With that early adoption, he believes, may come issues regarding appropriate use. In some cases, the technology is being used before substantial evidence of its success or failure can be gathered and reviewed. MedSolutions uses evidence-based guidelines when making decisions regarding requests for imaging services, Thorne says. In addition, this RBM has a patent pending on software it developed called Predictor Radiology Intelligence that tracks trends in physicians’ ordering patterns. For example, if a physician orders 10 shoulder MRIs, all consistent with the evidence-based guidelines for the injury, that pattern will be recorded. If that same physician makes a different diagnosis on the 11th shoulder injury, an alert is sent. Thorne says one of the goals of RBMs is to remain as transparent as possible in the healthcare treatment approval process. Between 50% and 60% of all requests for imaging services are answered in less than 15 minutes, he says, with a high percentage of those answered in five minutes. Overall, between 80% and 90% of all decisions are made in less than eight hours, he says. Negative is a word radiologist David Gruen, MD, would use when describing the effect of RBMs on patient care. As assistant chief of the medical staff at Norwalk Hospital in Connecticut, Gruen lives the experiences of his patients as they fight to undergo the imaging procedures prescribed by their physicians. Gruen, who also specializes in women’s imaging, believes that in the beginning, the intent of RBMs was to make sure the medical profession made appropriate decisions concerning imaging. However, as he tells the story of one of his patients and her experience with the preauthorization process, it demonstrates how he believes the process has strayed from its intended goal. The woman recently had an abnormal mammogram. The images were not specific enough to prove or disprove whether she had cancer, so Gruen ordered an MRI. The results of the MRI showed several spots 1 to 4 millimeters in size in one breast and one spot in the other. “It could have been nothing, or it could have been something,” Gruen says. Because of the patient’s family history of breast cancer, Gruen ordered a repeat MRI in six months. However, when it came time for the second breast MRI, it was denied, with a recommended less-expensive alternative of undergoing three breast biopsies. Gruen notes that biopsies come with their own costs and risks as an invasive surgical procedure. Gruen cites another example in which the RBM played a significant role in patient care. A pediatrician was using antibiotics to treat a diabetic patient believed to have osteomyelitis in his foot. When it became clear that the foot was not responding to the antibiotic, the pediatrician consulted with a radiologist, and they decided that an MRI was the most effective test to determine what was causing problems with the foot. Staff spent 90 minutes on the phone with the RBM, attempting to get approval for the imaging procedure. After 48 to 72 hours of medical review, the RBM ruled that the patient needed to undergo four to six weeks of antibiotic treatment and then see a specialist, who could order the MRI. The patient’s next step was to see an infectious disease specialist, who drew blood for testing. One week later, the patient was examined by an orthopedist, who ordered an x-ray of the foot. The x-ray was inconclusive, so an MRI was ordered. In the end, the MRI confirmed that osteomyelitis was the cause of the patient’s foot problem, and the proper course of treatment began. Maureen Zilly, director of government relations for the Medical Imaging & Technology Alliance (MITA), agrees with HHS that preauthorization may not be the best cost-cutting alternative for Medicare patients. The MITA is an imaging industry advocacy group whose board is comprised of executives from imaging industry manufacturers. Gruen points to physicians with imaging devices in their offices when looking for a cause of increased costs. Another side of the in-office imaging issue is patient convenience. If a patient can see an orthopedist and undergo necessary imaging in the same stop, it is quicker and more convenient. The June GAO report also noted a trend in site care, shifting substantially from hospital inpatient and outpatient settings to physicians’ offices. Diagnostic imaging conducted in the former location is governed by national Medicare standards relating to patient safety and quality, while the latter falls under less stringent oversight. In-office imaging is covered by Medicare Part B and was the specific subject of the GAO’s report, while imaging done in a hospital or other institutional setting is paid for under Medicare Part A and was not included in the findings. Under the Medicare physician fee schedule, physicians can be paid for performing the technical and professional components of the procedure, with the cost of the technical portion usually significantly higher than the professional portion. When imaging exams occur within a hospital or other institutional setting, such as a skilled nursing facility, the physician can only bill Medicare for the professional portion, and the hospital bills the technical component. On this topic, Thrall says the issue of reducing the number of unnecessary imaging exams performed in an in-office setting should be dealt with directly, with decisions taken out of physicians’ hands. Financial incentives for physicians to order more in-office scans should be removed. Accreditation should also help reduce self-referrals, he says, noting that, in some instances, in-office providers purchase low-quality or used equipment that was taken out of service elsewhere. “With quality standards in place for imaging equipment and technicians, we’re hopeful that some in-office providers will not be able to obtain accreditation,” he says. • It requires that all suppliers providing the technical component of advanced imaging services be accredited by a designated accreditation organization by January 1, 2012. • It requires HHS to establish a demonstration project to assess the appropriate use of advanced imaging services by January 1, 2010. Accrediting organizations have yet to be determined, but Thrall believes they may follow guidelines similar to those established by the ACR. He adds that accreditation is a vital component of the decision-making process when it comes to evidence-based imaging decisions. Zilly says her organization, which is a division of the National Electrical Manufacturers Association, fully supports establishing accreditation standards, not only for those doing the imaging and reading the images, but for the imaging equipment as well. The MITA recently sponsored a report completed by the business analysis firm Avalere Health LLC that outlines three emerging strategies for the responsible use of medical imaging: appropriateness guidelines; accreditation and certification programs for facilities, physicians, and equipment; and education and training programs. While Zilly acknowledges that the MITA’s opinions on the issue of preauthorization for imaging services comes from a membership comprised of imaging service developers and manufacturers, she says the interests here span the medical field. Thrall believes that implementing the ACR Appropriateness Criteria may help address the GAO report that identified nonradiologists’ lack of training in determining which exam is most appropriate as a factor in increased in-office imaging. The ACR criteria is a list of approximately 300 evidence-based guidelines developed by the college 15 years ago to provide guidance for referring physicians and other providers in determining the best methods for imaging a patient. The guidelines link the disease process to different methods of imaging. It utilizes a scoring process of one through nine, with one being the least applicable method and nine being the most appropriate. “Physicians review the criteria and determine the best method for the patient,” Thrall says. The ACR promotes the criteria’s commercial use to medical professionals nationwide. Thrall says Massachusetts General uses a software product that incorporates the criteria. He notes that local insurance companies have accepted this point-of-care patient support system. Imaging services are not the only targets of cost-increase analysis. Thorne says there are many parallels between the process used to order imaging services and the placement of pharmaceutical prescriptions. Both are disciplines of medicine that cover the spectrum of diseases, and both involve technol-ogy that is moving faster than any other discipline. In the end, Gruen would like to see radiologists treated as specialists in their fields. Radiologists must rely on referrals to provide patient care and need to follow specific standards in the care they provide.